I like them all though the eyes for the Brawl render are a bit odd, the renders in 4 and Ultimate always put a smile on my face. 4/10 - His head is not in proportion with his body, and his arms look weightless, and his tail is too thin. Pose is good though. 7/10 - Think the colours are too much here, but I love the **** eating grin on his face. Pose is a weird choice I must say. 9/10 - Fur detail is amazing, his limbs have weight to them, and the lighting is great. Loses a mark because seeing toenails freak me out. With a blank, bland expressionless face, Lucas rushes headlong into... battle, I guess? Don't know, it's not a pose that screams "DETERMINATION" as it goes about its business. The pose itself is fine, but there's not enough energy in spite of it. Less dynamic than the previous, but a little more intense. It's actually supposed to contrast with Ness' pose in Sm4sh, and go alongside it as a counterpart render. He looks a bit aggressive, which also contrasts with the smile Ness wears in his pose. Though, too be fair, Lucas has a lot less to smile about in his game. Still the render's decent. Honestly, I expected a little bit more from this render. The idea they went with is not what I expected or thought they'd go with, but it's fine. I found it a nice nod to his game with the Rope Snake, but confused as to why they chose the Rope Snake to be the main feature of his render. It's almost like it confuses the idea of how Lucas plays in Ultimate. 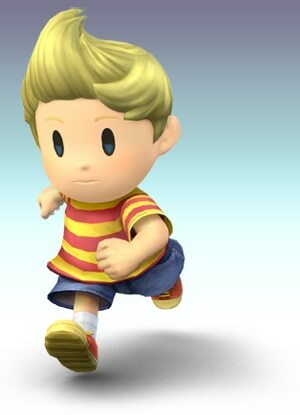 It doesn't really display his personality because Lucas never used the Rope Snake in Mother 3. How odd. Anyway, the render itself is fine, but nothing about it truly stands out. What do you guys think of Lucas' renders? : 7/10. A simple, cute, dynamic pose. Though his face looks kinda vacant. : 7/10. It's an effective pose but I'm not really fond of the face again, Lucas looks unnecessarily angry in it. : 9/10. This one is great. He has a distinct silhouette with Rope Snake, his posture and facial expression looks appropriately childish. You can see both his timid and headstrong sides at the same time. 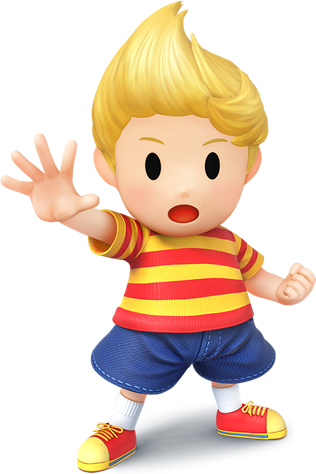 Lucas's Ultimate render is very odd with the use of the rope snake indeed but i love that lil' bugger so it doesn't bother me. 9/10 - Colours are miles better than Brawl's washed out look. And I adore that it contrasts with Ness' render. 8/10 - The render that probably best showcases his personality, however I'm not a fan of the ropesnake being there, mainly because it implies a different playstyle. Can we talk about his eyes in Wii U render, looking right at us, dead, and empty. 5/10: Not bad, not great. Exists, and that's about it. 9/10: One hand balled in a fist, and the other with fingers splayed, palm-out in a very commanding pose: this kid clearly has supernatural abilities, and his expression says he's not afraid to use them on you. 7/10: Not sure why the render centers around him "ooo-ing" at the Rope Snake, but it's cute nonetheless. 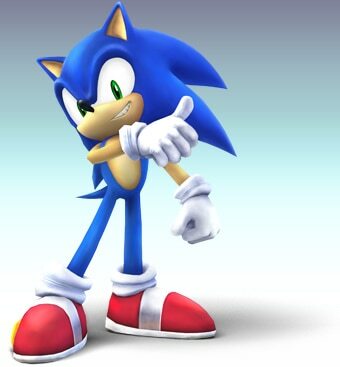 Starting off with one of the best reveals as a Smash character, Sonic gives us a pretty great render in my opinion. It's rather static, with no feel of movement or motion whatsoever, but it instead brings a crap-ton of attitude which Sonic has in spades. All of it works so well: the expression on his face, the cocky tilt of the head, the too-cool-for-school arm across chest position followed with a thumbs-up, all within a really confident stance. "I'm awesome and you know it!" With Sm4sh, Sonic was announced during a real rough part of my life, so he helped me find joy in a moment where I needed it most. But does his render reflect that? Well, it's Sonic, that's for sure. 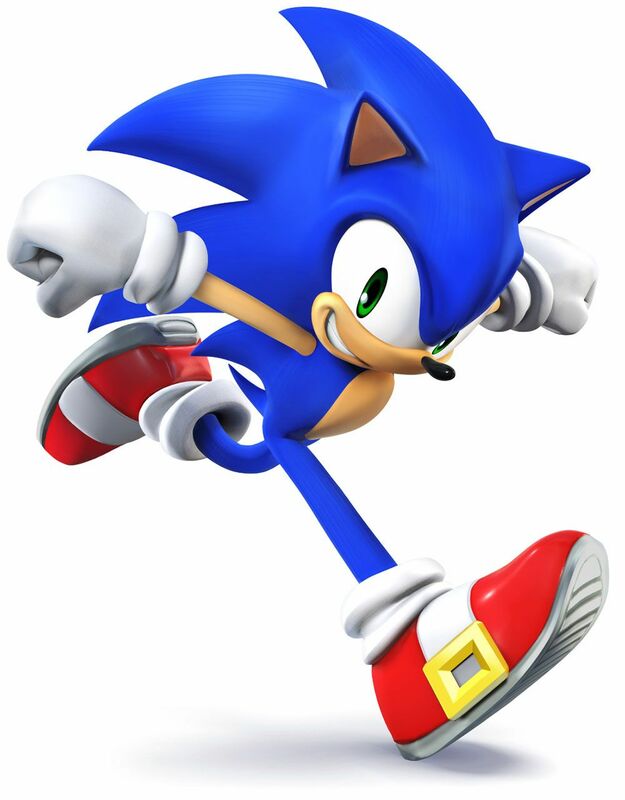 He's in his signature running form, ironically in a render that doesn't feel as dynamic as it seems it should. Maybe if his head and torso were arched forward more? It's more like a casual jog as opposed to going fast. But all that said, it's still a pretty good render if you ask me. The hilarious amount of negative space around his front leg is eye-catching, though. Kudos for that. Hoo boy, I'm getting major Sonic Adventure vibes... and for me, that's a good thing. I love how freeform he looks here, as if gravity doesn't matter all that much to our hedgehog friend. It doesn't even look like he's kicking, he's just putting his leg in the air because he freaking can. I think everything that Sonic embodies is represented well here: free spirit, weightless and unrestricted, cockiness and confidence, he's even got the "I'm better than you" smirk which doubles as an "I'm having a ton of fun right now" smile. The silhouette is amazing (though the previous renders had good ones too) and really shows off a nice example of Sonic's overall shape. What do you guys think of Sonic's renders? Overall, I think blue boy's had some incredible renders over the years. brawl 8/10 I love how he gives off an aura of "I don't even need to be running because your too slow"
Brawl: Despite the lack of motion or movement this pose embodies Sonic’s confidence and cockiness to a T; you really get this sense of readiness to kick some *** while also looking good in the process. You can really see the vigor, the liveliness and the power in these render/artwork and I’m just not really seeing that in his Sm4sh render. Could’ve been a lot better but it’s not bad. That’s because this render embodies Sonic character designer Yuji Uekawa’s design philosophy; he’s infamous for drawing and posing the characters with a graffiti ideology which helps tremendously in communicating constant movement. - This pose was repurposed from Uekawa’s concept art for Sonic’s redesign; it ended up being used for Sonic R promotional material which predates Sonic Adventure’s official reveal (August 1998). This appears on SEGA’s official Twitter account. Wether you hate him or love him, you can't deny that he has one of the best set of renders in the whole cast. Look at this cocky son of a gun, he's got that "They delayed the whole game just to include me, radical !" look. Not as cheeky (and a bit creepy) but still very good. I love Sonic's Ultimate render the most since it captivates his personality in all the right ways. And the art shown above makes me wish that Brawl newcomers got posters/artwork like Smash 4 did. It would've been pretty cool to see Yuji Uekawa draw Sonic going against Mario and the other fighters to an extent. : 8.5/10, snarky, cocky, and just over all a classic Sonic render. : 8/10, about what you’d expect. Pretty base line cocky arrogant Sonic render. : 10/10, ACTUALLY AMAZING. 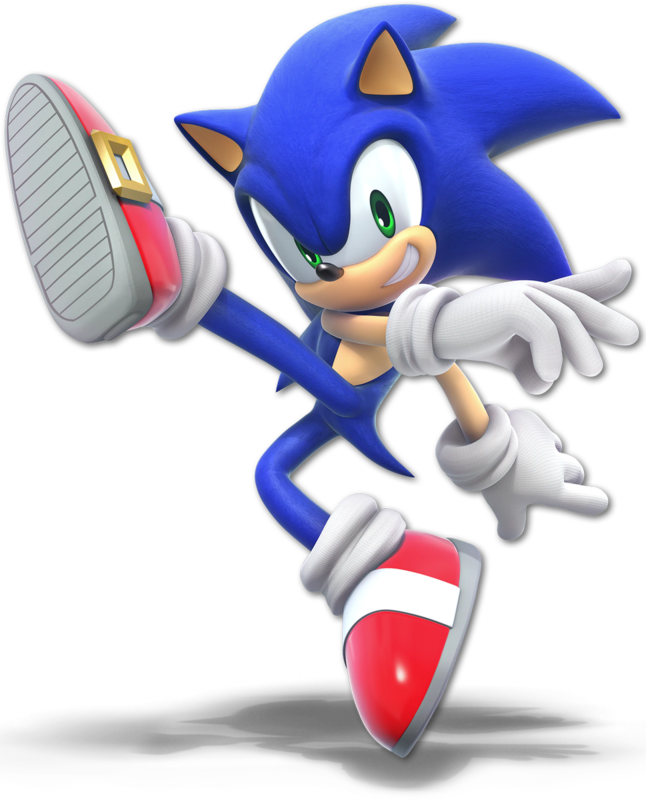 His pose is so lively and dynamic, it’s like Adventure style but it just gives off the kind of life that the godlike Sonic Mania animation given 3D modern life! And that smile, it shows his cockiness and prideful ness but also that “just here to have some fun” demeanor! It’s beautiful, beautiful! Mwah, mwah!